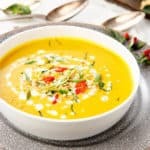 This Thermomix Thai pumpkin soup reminds me of my favourite Thai red curry. It's full of flavour and deliciously warming with a hint of spice. The soup is made using a commercial red curry paste and coconut cream for a fast weeknight meal. Place the garlic and onion in the TM bowl. Chop 3sec/Speed 5. Scrape down TM bowl. Add butter to the onion mixture. Saute 3min/120 degrees/Speed 1. Add the potato and pumpkin to the TM bowl. Chop 15sec/Speed 7. Scrape down the bowl. Add the stock, salt, Thai chilli paste and half the coconut cream. Cook 20min/100 degrees/Speed 1. Add the remaining coconut cream (reserve 1 TBS for a garnish if desired). Blend 1min/Speed 5. Increase the speed gradually up to 9. Serve the soup into individual bowls and garnish with coconut cream, nuts, kaffir lime leaves. If you would like to make your own Thai Red Chilli Paste take a look at my recipe.